Thoughtful evolution of Taylor's stalwart 14ce mould, making brilliant and beautiful use of solid maple. Serious all-rounder. Maple offers unique, flexible tones. Usual high quality Taylor build. Taylor has always been a firm famed for its innovations. It's not just products, either; 2012 and 2013 were watershed years for the company, as top man Bob Taylor slowly but surely handed the chief designer/luthier's mantle to one Andy Powers who, for 2014, went about a belt-and-braces redesign of the company's heartland 800 Series guitars. Next on Powers' project list was the subject of this review: Taylor's solid maple back-and-sides 600 Series, all-new for 2015. "The 600 has a forward- thinking component," he explains as we ask about the motivation behind the redesign. "As we look forward 10, 20 or 30 years, at the condition of forests around the world and wonder what our wood supply will be like, it's not all that rosy. If we still want to be building good guitars out of wood 20 or 30 years from now, what are they going to be made of? For us, one part of that answer is maple." "The first surprise is that the maple back and sides are dark brown-coloured"
Powers goes on to explain how maple is grown not just in the United States but also in Europe and Asia, and is very well managed and harvested, meaning a good prognosis for its ongoing use for the backs and sides of acoustic guitars. "Maple, to me, has a few limitations in the way that we've traditionally used it," continues Powers. "It does have some great attributes; it's super- linear, it's really transparent... it's got all these cool things going on for it, but it seems that the most kind thing that guitar players say about a maple flat-top is, 'They amplify well', or 'it's a great stage guitar'. "To me, that's not really fair. In the violin world they've insisted on nothing but maple and spruce for the last, well, 400 years!" 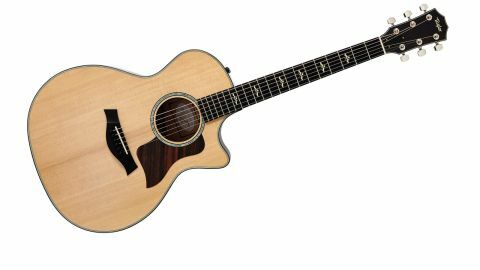 Here our review guitar is the 614ce Grand Auditorium; the 1994 design that has become most synonymous with the brand. The first surprise is that the maple back and sides are dark brown-coloured, not the very pale, or indeed brightly coloured hues of Taylor's previous 600 Series. Instead, Powers developed a hand-burnished process to apply the colour that adds no measurable thickness to the overall finish. Seen from a few feet, you'd have no idea this was a maple-bodied guitar, which may be a good or bad thing depending on your viewpoint. The back and sides are bound tastefully in ebony and figured ivoroid for some extra, understated class, and it's worth mentioning Taylor's superb level of craftsmanship at this point. There are significant changes inside the guitar. Just as he did with the 800 Series redesign, Powers has focused intently on the back design of the 600s, most significantly by designing the bracing structure to stop short of the rims on all models except the Grand Orchestra (618e). "The 614ce sounds focused in the midrange, yet has oodles of bass"
"I was stealing a page out of my archtop building book," he explains of how shortening the back braces enabled him to "get more" out of the maple and produce more of the sounds he wanted from a flat-top guitar. The 614ce also has the slanted back bracing pattern and side struts we saw first in the 800 Series redesign; Powers tells us he designed the GO shape from the ground up a few years ago and had maple very much in mind when doing so. The new 600 Series solid Sitka spruce top is interesting for a couple of reasons: firstly because it uses the latest, model-specific 'Advanced Performance' bracing patterns developed for the 800 Series last year and secondly because they've been, er, cooked! Powers experimented with torrefaction for the tops, whereby they go through a high-temperature process that ages them slightly, but also makes them go a slightly darker hue that, along with the tasteful, striped ebony pickguard, dark ebony bridge and fingerboard, fits perfectly with the understated, classic aesthetic of the whole guitar. There's not much to say about the Taylor neck that hasn't already been said; a superbly inviting blend of grown-up acoustic playability in terms of string spacing and nut width, and the very subtlest of hint of V in the profile towards the lower frets. The 614ce sounds focused in the midrange, yet has oodles of bass. A perennial fave of this writer is a 2012 714ce model, and by comparison the 614ce is slightly brighter sounding with less of the colour and plumminess around the mids, though it has notably more piano-like depth and clarity to bass notes; in that sense the 600 is a very decent contemporary fingerstyle guitar. It also shows up the value of the latest Elixir HD Light phosphor bronze strings; nothing new in the metallurgy or construction, but the hybrid gauge - 0.013, 0.017, 0.025, 0.032, 0.042, 0.053 - really does add some authority and fullness to the top strings compared with a regular 0.012 to 0.053 set. More generally, the guitar has something of maple's brightness and zing about it - it would be a real shame if it didn't - but there's no doubt that it's a vastly different experience compared with a Gibson J-185 or J-200, to cite two very famous examples. We didn't have a previous 600 Series Taylor to hand for comparison, but if the difference between the new and 'old' 800s is anything to go by, you can be sure of a big change. The sound is closer to what you might expect from an under-saddle pickup (where the original Expression System is vastly different), with a good, healthy output for your amp or PA. Despite the ostensibly simple controls (bass, treble and volume), the way they interact means you can coax a wide range of sounds from the guitar. Just like last year's 800 Series update, the new 600 Series instruments will surprise and educate in equal measure and do indeed offer a new way to consider maple as a serious alternative to the all-conquering rosewoods and mahoganies of the acoustic world. The 614ce should definitely be auditioned alongside the 5-, 7- and 814ce models as a serious all-rounder for contemporary styles and playing. Clear, deep bass, a joy to strum and satisfying to pick, it has a voice all of its own without doubt.